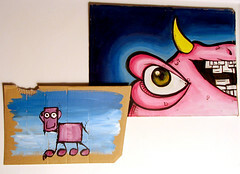 Fine art, Illustration, graphic design and the art philanthropy of Sam Morrison: Art Trade with "My Dog Sighs"
Art Trade with "My Dog Sighs"
My Dog Sighs provided me these cardboard paintings to leave in public places around my town. MY DOG SIGHS is one of my favorite guerilla artists. He frequently leaves pieces of art for people to find in his town of Southsea, Hants in the United Kingdom. It was a real honor to be sought out by him for an art trade. Typically MDS is known for his bold jelly fish paintings but recently he's decided to experiment with some new characters/styles. I feel very fortunate to have been the recipient of one of his new paintings. 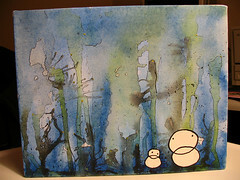 MY DOG SIGH'S Art Here! Free Art Friday web site. A site devoted to leaving works of art in public places for people to find. MDS is a founding member. Very nice to know that, Sam. MDS's pieces are adorable! hey Sam, thanks for stopping by. and your stuff rocks. "MY DOG SIGHS is one of my favorite guerilla artists." one of mine too.